Kelly is an artist and educator who grew up in Ludlow, Ky. After high school he attended the Art Academy of Cincinnati and earned a bachelor of fine arts degree in sculpture. 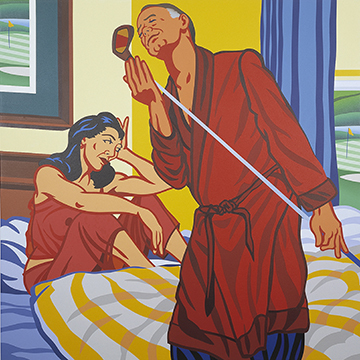 He moved to New York City for six years, working as a studio assistant to Pop artist Tom Wesselmann. As a child Kelly drew non-stop, inspired and coached by his father, who nurtured his talent, teaching him perspective, creating images for him to copy. Although his degree is in sculpture, Kelly shifted entirely to painting after college. From the beginning, Kelly felt that art needed content and that it need­ed to convey a message. He is not an abstraction­ist, but rather a figurative painter whose work tells a story, is socially aware, and taps into the emo­tions of the time. As an undergraduate he cre­ated works on apartheid and Nazism, in particular the “Monster of Vienna,” a Nazi with no remorse for his atrocities – topics prominent in the news. While working at Wesselmann’s studio Kelly continued his own art. He created a series of black cutout still lifes that did not satisfy him; they prompted him, however, to move in a different direction – Pop art. With humor, Kelly’s work examined various facets of the human drama. Family issues, relationships, communication and mispercep­tions all found their way into his paintings, often with a dose of cyni­cism and sarcasm. Paradigm Lost is based on a car advertisement from the 1950s. A man is driving; his wife is blindfolded. The message of the ad is that the car runs so smoothly the wife is not even aware of the ride. Kel­ly re-contextualized the image to reflect upon the issue of the ever-changing roles of gender and identity in society. In Club Lust, an apparently wealthy married couple is shown in the intimacy of their bedroom. While the wife is waiting, sitting on the bed, her husband is instead admiring and enamored with a golf driver. The bedroom window opens on a golf course and an image of the same hangs on the wall. Kelly used the painting as a metaphor for the hidden aspects of relationships, for what is expected, what actu­ally happens or does not happen; he depicted in it the openly unspo­ken truth, reality versus perception, the dissonance of the moment encountered in personal exchanges. The painting also alluded to the role sports play in people’s lives, particularly at retirement – a curse and a blessing at the same time. Many of Kelly’s topics come from his personal experiences and re­flections. The more he delves into them, the more he connects with himself, his emotions, his beliefs and values. It is an uncovering pro­cess, like peeling off the skins of an onion, exposing layer after lay­er. Often and sometimes after the fact , he says, he realizes that his paintings subconsciously relate to his own history – his divorce, for instance – yet have a universality due to their basic human subject. Kelly always tries to convey his thoughts and messages with subtlety and humor. He does not want his paintings to impose his views; he strives to understand and represent the other side, engaging viewers in the debate, expanding their awareness, indi­rectly leading them to the spirituality of life. All along Kelly has been interested in his own spiritual quest. A year ago he became dissatisfied and wanted to part with the cynical dark humor of his work, striving instead for more beauty, joy, serenity. He began reevaluating his belief system, meditating daily, embracing Taoist philosophy and learning the disciplines of Qi Quong and Tai Chi. This led his work into a new direction. He is now focusing on painting calm and harmonious landscapes, conveying the awe and grandeur of nature, its perpetual change, its peace and spirituality. They are small, intimate, meditative paintings. “I began looking at places I’ve passed hundreds of times, re­ally noticing their beauty and abundance for the first time,” Kelly says. “Nature is in a continual state of becoming, and I equate it metaphorically in these new landscape paintings to one’s journey from ego to spirit. Kelly’s art always comes from his heart. Whether through Pop art or new landscape paintings, it affirms who he is, conveys his beliefs and worldly views, shares his spiritual journey. Using sym­bols and metaphors, it aims at a higher level of understanding and consciousness, at the fullness of life, at the universality of truth.